Slots Heaven casino is giving one lucky player the chance to win a massive £7,000 in cash in its new promotion. All you have to do is opt in to the promotion and make a deposit of at least £30 to be in with a chance of winning. Every £30 you deposit gives you one entry into the prize draw so the more you deposit the better your chance of winning. For instance, if you deposit £300 then you will receive ten entries to the draw. The promotion is ending on Thursday 5th May so there is still plenty of time to enter the promotion and give yourself the best possible chance of winning. 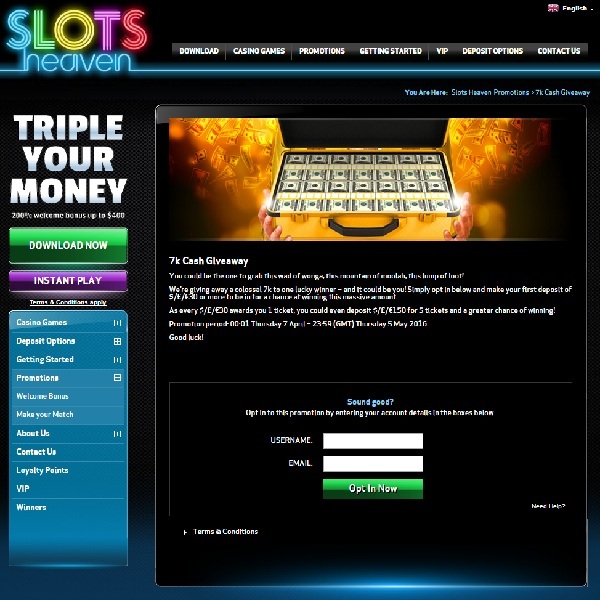 Head over to Slots Heaven casino today and with a bit of luck you could soon be the winner of a massive £7,000 in cash.